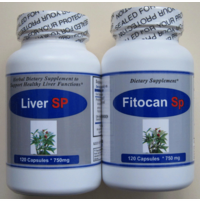 Each Hepatitis-Induced Cirrhosis kit contains one bottle of Liver SP and one bottle of Fitocan SP. This product combination is recommended as natural nutritional support for people suffering from Hepatitis-induced liver cirrhosis . The developers of this proprietary formula believed that a body and organ system in balance has a greater potential to recover from the underlying imbalances associated with liver disorders. Supporting healthy liver function is important for those experiencing liver challenges including jaundice, cirrhosis, hepatitis A, B or C, alcohol-induced fatty liver and autoimmune liver disorders . Liver-SP's synergistic ingredients may also provide support for liver protection and anti-fibrotic activity, immune stimulation, liver micro circulation and cleansing enhancement, as well as bile secretion. The foundation of this natural herbal approach is based on the best knowledge from traditional Chinese medicine (TCM), Indian folk medicine, and Vietnamese naturopathy. Continual use of Liver-SP can also support the liver's key functions such as healthy digestion, detoxification and energy storage.